during 2-day event designed to bring people together — through music. Jefferson Street United Merchants Partnership (J.U.M.P), welcomed more than 4,000 people to the 17th annual Jefferson Street Jazz & Blues Festival (JJBF) weekend. The fun kicked off with the “Bridging the Gap: New Face, New Place” Mixer and Block Party in downtown Nashville on 5th Avenue South on Friday, June 16. 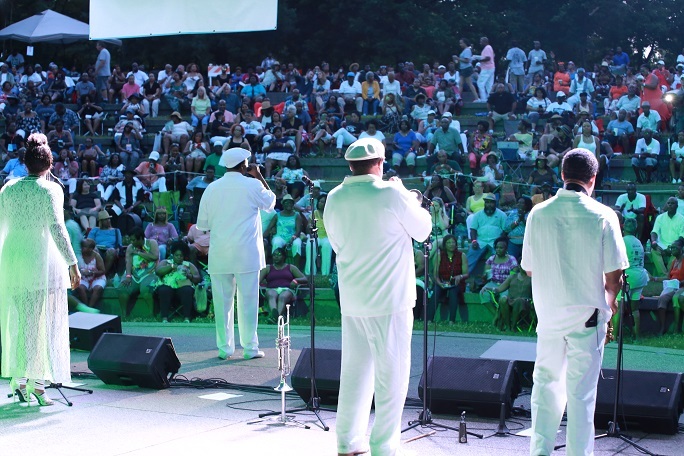 Festivities continued on Saturday, June 17 with the main event hosted at the Bicentennial Capitol Mall State Park, featuring some of Nashville’s favorite local artists as well as national recording artists Shirley Murdock and Rose Royce. A venue change for this year’s 15th annual “Bridging the Gap Mixer: New Face, New Place” created a SoBro Block Party atmosphere that included performances from local favorites—William Davenport and Wendell “Bizz” Bigsby-Church & Everyday People—as well as two djs, live music, and a variety of food and retail vendors. Nearly 1,500 people danced in the streets, many of them new faces spilling out from the Country Music Hall of Fame and the Omni Hotel, all excited to join the party that gave them an alternative to country music-themed events usually hosted in the area. Also new to the Friday event was the inaugural JJBF Hot Chicken Contest, judged by the honorable Howard Gentry and acclaimed chef Darryl Dinning, who named Erica’s Touch of Taste Food Truck as the contest’s winner. Saturday’s main event at Bicentennial Mall kicked off with a high energy performance from Rahsaan Barber and included Bayou & the Degradables, Herschel Bailey and Paula Chavis.